Kirsten Hubbard lends her artistry to this ultimate backpacker novel, weaving her drawings into the text. Her career as a travel writer and her experiences as a real-life vagabond backpacking Central America are deeply seeded in this inspiring story. It's no secret by now that I love books in foreign or exotic settings, so when I saw that this book took place across Central America, I knew that I had to read it. Although Wanderlove didn't turn out to be exactly what I was expecting, in this case, that was a good thing. Bria has never been one for traveling, but the summer after she graduates from high school, she is determined to change that. When her two friends back out on their planned trip through Europe, Bria finds another option - a tour of Central America with the Global Vagabonds. Bria is expecting teens ready for fun and adventure there, but instead she finds middle-aged tourists with every minute carefully planned. So when she has the chance to leave the group and follow true backpackers Rowan and Starling, she takes it. Only Bria isn't prepared for true backpacking, in more ways than one. But more than that, she isn't prepared for the emotional journey that this trip will become. As she comes to know Rowan, Bria learns not only about him but also about herself, about the person she can be and what it means to put the past behind you. I've tried to take some time to process this book before writing this review, but I'm still not sure where to start. 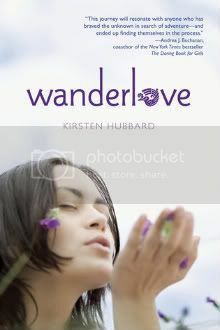 Wanderlove is beautiful, breathtaking...just a fantastic novel. Everything in this book became real to me, from the character to their emotions to the settings in Central America. It was incredibly easy to sympathize with Bria, to feel her pain. I love that her story is revealed gradually over the course of the book rather than presented all at once. The same holds true for Rowan. The physical and emotional journey that these two characters take is nothing short of amazing. They both have a lot to move past, and I loved reading what philosophies they used while making their attempts to move on. There is also Starling - I would have liked to have seen her more, but I enjoyed getting to know her when I could. These were characters I was not ready to say goodbye to at the end of the book. This book made me think about a lot of things; it gave me new perspectives and ideas to consider. There seemed to be a lot of profound truths buried in seemingly everyday conversation. Wanderlove was the first book in a long time that I've wanted to read again right after I finished so that I could soak up anything I might have missed on my first read. I want to relive the experience and the journey of this book over again. Wanderlove was everything I could have wanted in a travel novel and more. From the beautiful and vivid depictions of the scenery to the emotional journeys of Bria and Rowan, I fell in love with everything about this book. I can't wait to read more by Kirsten Hubbard! I loved Hubbard's first novel...something Mandarin, it was called, and although I don't remember the title I do remember the book being awesome. Wanderlove looks just right for me. I've been seeing this around and it sounds like a really good novel! Thanks for the excellent review. I'm fortunate enough to have an egalley of this book. Totally loved it! Made me want to travel another tropical country. Thanks for an honest and wonderful review! I absolutely LOVE Kirsten Hubbard. Her writing just really seems to be my inner thoughts written on paper. It's so uncanny how she can do that. Sounds like you really loved this one!